With musical skills that would easily fit into many rock bands Duncan Oakley performs an infectious mix of musical comedy and stand up with one of his trusty guitars - Maurice (Fender Strat), No.7 (acoustic) or his Les Paul (the Lezza) by his side. With an eye and ear for the silly, rude, playful and downright irritating occurrences of life Duncan musters up songs that not only make you laugh, they bury into the recesses of your mind and find you a humming tune with a smile on your face 3 days later, confused and wondering where it’s come from. 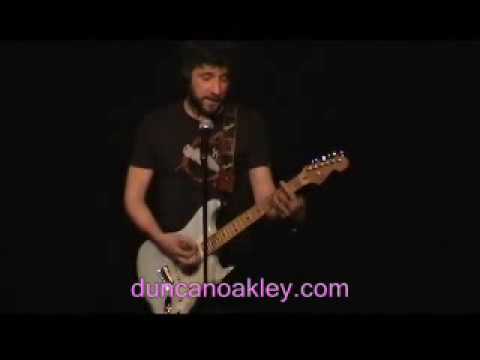 Duncan has performed for nearly 10 years on the stand up circuit and performs regularly at some of the UK’s bigger weekend clubs as well as festivals, & Uni gigs. A talented all-round musician Duncan can also perform with harmonica, drums & piano as a one man musical whirlwind. Stand Up Gigs: weekends @ Jesters, Frog & Bucket, Rawhide, Hyena, Komedia, CKP gigs, Comedy Club Ltd, Download Festival, Kendal calling, Stockton Riverside Festival, Uni’s across the country. Film: Eddie the Bass Player in Front Man made by Ben Hyland (Beat 24 Productions) Release date early 2009.